A chilling article from American Thinker. Islam versus Buddhism: Is The Fate of the Infidels Tied to the Buddhas? "No fanfare and little notice marked the 10th anniversary earlier this year of the destruction of the 1,500-year-old Bamiyan Buddhas. 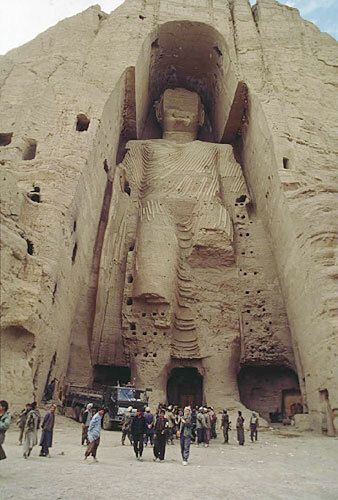 These 6th-century stately statues carved into sandstone cliffs in central Afghanistan included one of the tallest standing Buddhas in the world. On March 12, 2001, the 180- and 121-foot Buddhas crumpled under dynamite set off by the Taliban -- the Islamist militia group ruling Afghanistan from 1996 through late 2001. Mullah Omar, the leader of the Al Qaeda-supported movement, deemed the statutes idolatrous graven images insulting to Islam and ordered their destruction. Other Buddhist images, including statues and relief carvings as well as ancient Sikh gurdwaras and Hindu temples, were also destroyed by the Islamic terrorists belonging to the Taliban Movement. This kind of cultural destruction has been part and parcel of Islam since its inception. According to Dr. Bill Warner, founder of the Center for the Study of Political Islam, "Political Islam has annihilated every culture it has invaded or immigrated to by destroying the host culture." Dr. Warner cites the extinction of a once-Christian Middle East, Turkey, and North Africa, and a Zoroastrian Persia, as a result of Islamic jihad. He also includes the decimation of Hindus and Buddhists as well. All told, he totals more than 270 million "nonbelievers," including Christians, Buddhists, Hindus, Africans, and Jews, who have died in Islamic massacres since the birth of Islam 1400 years ago. ...By the 11th century, the region that includes modern-day Afghanistan had been Islamized and the remaining Hindus and Buddhists were stripped of their legal and social rights and relegated to dhimmi status. This meant they were required to exist under shariah or Islamic doctrine and forced to pay the jizya, a tax payable to Muslims to guarantee protection against forced conversion or death. To put this cultural destruction in context, we need to remember that Islam, by its very nature, is obsessed with hatred against non-Muslims and their culture. This attack is what's known as a 'Dominance Crime'. Islamic Sharia law states that non-Muslims must either be converted, or enslaved and humiliated as second-class citizens (dhimmis), or exterminated. "Hatred of non-Moslems is the pivot of Islamic existence. It not only declares all dissidents as the denizens of hell, but also seeks to ignite a permanent fire of tension between Moslems and non-Moslems; it is far more lethal than Karl Marx´s idea of social conflict which he hatched to keep his theory alive." Christians and Jews are the only people eligible for dhimmi status, being allowed to live under Sharia laws provided they pay the extortionate jizya 'protection' money and suffer institutionalised humiliation uncomplainingly. However they may not build new places of worship nor repair existing ones. Jews and Christians are classed as 'people of the book', and Islamic propagandists use this phrase to claim that Sharia treats them favorably by allowing them to live. Buddhists are often given no such option. They are 'mushrikūn' (singular: mushrik) - idolators whose religion should not be tolerated in any form. According to the strictest interpretations of Sharia, Buddhists must either convert to Islam or be exterminated, and their places of worship must be obliterated. It is therefore very much in Western Buddhists' interests to resist the creeping Sharia that is slowly being imposed on the United States and Europe, even if this involves getting more involved in politics than many of us would like, and making some unusual alliances. 'Dhimmitude is the status that Islamic law, the Sharia, mandates for non-Muslims, primarily Jews and Christians. Dhimmis, "protected people," are free to practice their religion in a Sharia regime, but are made subject to a number of humiliating regulations designed to enforce the Qur'an's command that they "feel themselves subdued" (Sura 9:29). This denial of equality of rights and dignity remains part of the Sharia, and, as such, are part of the legal superstructure that global jihadists are laboring to restore everywhere in the Islamic world, and wish ultimately to impose on the entire human race. Spearheaded by dhimmi academics and self-serving advocacy groups, that same attitude of chastened subservience has entered into Western academic study of Islam, and from there into journalism, school textbooks, and the popular discourse. One must not point out the depredations of jihad and dhimmitude; to do so would offend the multiculturalist ethos that prevails everywhere today. To do so would endanger chances for peace and rapprochement between civilizations all too ready to clash. But in this era of global terrorism it must be said: this silence, this distortion, has become deadly. Before 9/11 it was easy to ignore and whitewash dhimmitude, but the atrocities changed the situation forever. In jihads throughout history, untold millions have died. Tens of millions have been uprooted from their homes. Tens of millions have been stripped of their cultural identity. To continue to gloss over the destruction wrought by jihad ideology and its attendant evil of dhimmitude is today to play into the hands of jihadists, who have repeatedly vowed to dhimmify the West and destroy any recalcitrant elements. While jihadist groups, even with their global diffusion, are not strong enough to realize this goal by themselves, they have a potent and destructive ally, a genuine fifth column, in the dhimmi academics and dhimmi journalists they have recruited in the West. They have succeeded in confusing millions in the West into mistaking honesty and truthfulness for bigotry, and self-defense for oppression"
Islam is a destructive death-cult founded by a psychopathic child-molester. Islamic culture can't create anything or contribute anything to the rest of humanity, and the only way that Moslems can make their mark on the world is by destroying the products of superior cultures. Islam (not just the 'militant' variety) is a menace to us all, Buddhist and non-Buddhist. At last some of the MSM are waking up to this threat. Here's a truly excellent article in the Daily Telegraph on the delusional psychology of this aggressive, arrogant death-cult. Jihad in Thailand: Muslims murder last Buddhist in South Thailand town, kill five soldiers responding to the call. More Muslim supremacism in Thailand. Muslim "separatists," in other words, Islamic imperialists. Apart from the over 17,000 documented Islamic attacks since 911, it cannot escape notice that anywhere Muslims live with non-Muslims, there is conflict. The larger the Muslim population in the (non-Muslim) host country, the larger the conflict. As for the rest of the "1.5 billion" Muslims in the world, they live in Muslim countries, so of course they are generally not fighting anyone...... those countries are Muslim, there is no one to fight. In another time and place, towns were declared "Judenfrei". Here in Thailand we have a word "Kalangcote" (Pronounced "Ka-lang-coat" in English), meaning "To clean right to the root" when talking about murdering all generations of a family. The town of Ban Jarolibong in Narathiwat Province, Thailand is now "Buddhist Kalangcote": completely cleansed to the root of all Buddhists. Early this morning "suspected Muslim militants" shot and killed last Thai Buddhist in town while he was working at his rubber plantation. The terrorists then used a large bomb buried in the road to kill five defence force volunteers responding to a report of the farmer's murder. It was a trap with the murder of the rubber farmer as the bait to lure the defence volunteers to drive over the buried bomb. Only ten years ago when I passed through Ban Jarolibong, the town was about fifty-fifty Buddhist and Muslim. The Buddhists are completely gone now. All the town residents are Muslim, whether they are of Thai or Malay heritage. Today's Bangkok Post account of the murders states that over 4,500 have been killed in the south since January 2004, but that only tells a part of the story. As I recounted in an earlier letter that Atlas Shrugs published as "THAILAND MASS MIGRATION DUE TO MUSLIM TERROR"
"Here in Thailand things are so bad that every quarter thousands (most likely tens of thousands) of non-Muslim (primarily Buddhist) Thai citizens in the south are abandoning homes, jobs, businesses, land holdings and generations of work to head for safer northern provinces. Their holdings are sold for a song to local Southern Muslims. This is the plan of the Muslim terrorists of course, and it's working. This forced mass migration of Buddhists and abandonment of property and homes in the south of Thailand is a part of terrorism story that is largely unreported in the local or international press." For confirmation that this forced mass migration continues in Thailand, one need look no further than today's news that town of Ban Jarolibong has finally achieved "Buddhist Kalangcote". Hi, please follow this link and watch a program about Geert Wilders. If he was also trying to get rid of all monotheism then he would truly have my vote. Nevertheless he is still fantastic! 56% of Canucks see unending struggle with Islam. "A majority of Canadians believes conflict between Western nations and the Muslim world is "irreconcilable," according to a new national survey that revealed a strong strain of pessimism in the country leading up to Sunday's 10th anniversary commemorations of the Sept. 11 terrorist attacks on the U.S. The survey of 1,500 Canadians, conducted over three days last week for the Montreal-based Association for Canadian Studies, showed 56 per cent of respondents see Western and Muslim societies locked in an unending ideological struggle, while about 33 per cent — just one-third of the population — held out hope that the conflict will eventually be overcome. " Every religion has a 'Superior Intention' - a defining statement about its objectives. For Buddhists it is to save all sentient beings from suffering, for Christians it is to “Love the Lord your God with all your heart and with all your soul and with all your mind and love your neighbor as yourself’, and for Jews it is to be 'A Light Unto Nations'. Islam also has a superior intention, as set out in Koran Verse 9:123 - "Make war on all non-Muslims who dwell around you." with the objective of expanding Islam and eventually conquering the whole world. So we see that while the other religions are concerned with ethical conduct and benefiting others, Islam is primarily concerned with its own growth by whatever means may be necessary, no matter how vicious. Islam has much in common with a cancer or virus, functioning only for its own growth and spread to the detriment of the rest of the body. In ruthlessly propagating itself, the virus of Islam ('as dangerous in a man as rabies in a dog', according to Churchill) negates the superior intentions of the other religions, causing suffering and hatred, and bringing darkness to every nation where it gains a foothold. Consequently, Islam isn't a religion but an anti-religion -- a bullying, predatory, thuggish, supremacist, sadistic and evil totalitarian cult like Nazism. "...Without extortion, threats, bullying and blasphemy restrictions, Islam doesn't stand a chance in the free market of religions"